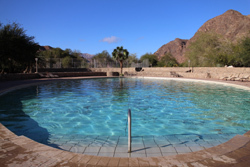 The Ai Ais resort is located at the southern end of the Fish River Canyon and is famous for its hot sulpher springs upon which the resort is built, all the water in the resort is heated by the natural hot springs. There are two swimming pools at Ai Ais one outdoors near the entrance to the resort and one indooors close to the rooms both heated by the hotsprings giving them a constant warm temperature all year round. The healing properties of the naural hotsprings at Ai Ais are said to be particuarly good for rheumatism but both pools provide relaxing bathing and swimming for everyone young old healthy or infirm. Ai-Ais, which means "burning water" in one of the local languages, refers to the sulphurous hot springs which are found in this area. One of these springs has its eye within the camp. 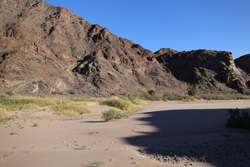 Ai-Ais lies at the southern end of the Fish River conservation area and is wherer you will finish the Fish River 4 day hiking trail. 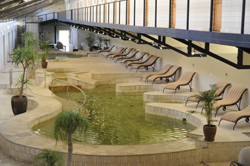 The main attraction at the resort is the spa complex. 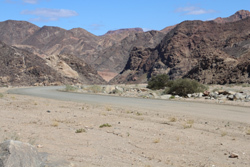 The extreme heat heat of the springs date back to 1850 when they were discovered by a Nama herder searching for his lost sheep. The water is supposed to have natural curative ingredients and is especially therapeutic for rheumatism sufferers. 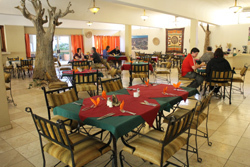 The resort has a restaurant and bar, serves buffet meals for breakfast, lunch, dinner and accommodates a maximum of 100 visitors. 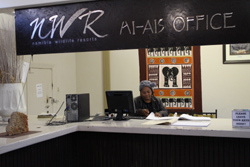 There is also room service, laundry services, secure parking, safe at the reception and disabled ramps into the building and into all the rooms. 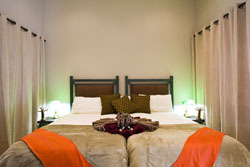 The resort offers 43 rooms in total with 36 of them being brand new. 12 of the rooms have a river view, are en-suite with a bath and are equipped with air conditioning, an outside shower and a tea / coffee station. 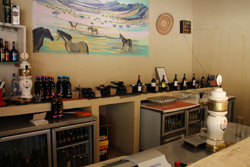 The 7 premier chalets are suitable as family or large group accommodation and they have an en-suite bathroom, tea / coffee station and air conditioning. 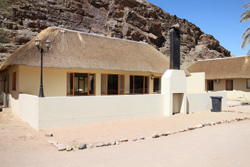 Being a self catering accommodation, the kitchen is equipped with a 2 plate stove, kettle, fridge, cutlery. pots and a microwave oven. The chalets boast 2 verandahs, both with mountain and river views. 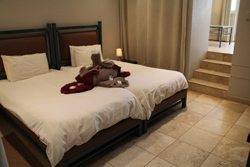 The rest of the 24 rooms are equipped with air conditioning, tea / coffee station and are en-suite. They also have spectacular mountain views. 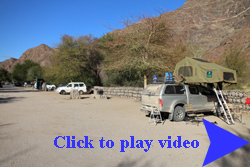 Camping site The Camping Site at Ai Ais is situated right alongside the riverbed at the end of the Fish River Canyon. 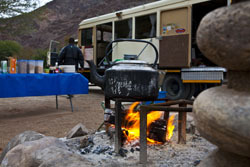 With clean ablutions and areas for washing dishes the camping site at Ai Ais is a pleasant if warm place to camp in Fish River Canyon. 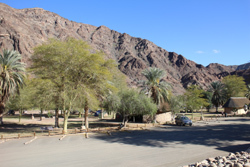 Campers can make full use of all the resort facilities.